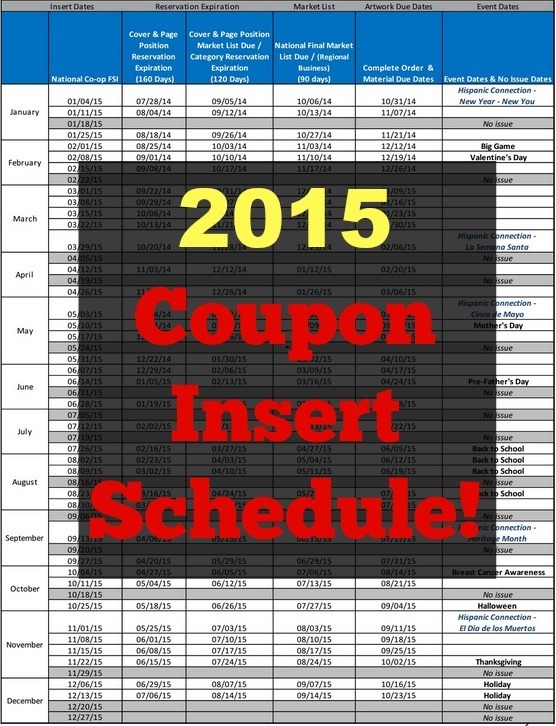 UPDATE: The 2016 Coupon Insert Schedule is out and probably what you are looking for. Coupons in the News has released the 2015 Coupon Insert Schedule and there is a lot to look forward to! The month of January alone will bring us a whopping 11 inserts which is great because we didn’t have hardly anything in December. You can also see a PDF of the SmartSource schedule here and the Red Plum Schedule here. Also, before we get into the actual schedule, let me recommend Coupons in the News to you. I know I’ve linked to them before but it has become one of the first things I read in the morning to stay abreast of what is going on in the couponing world. They do good work over there. Now here is that schedule.